After watching Tigers, you may be wondering whether the companies are still behaving badly. 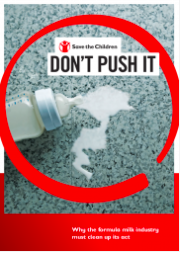 On this page are links to a number of reports from a range of organisations that show clearly that they are and that children’s health and lives are being threatened by marketing practices promoting baby feeding products. The International Baby Food Action Network (IBFAN) produces the most extensive, reliable and regular reports of the global situation. 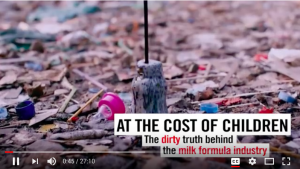 We use the International Code of Marketing of Breastmilk Substitutes AND the subsequent, relevant Resolutions of the World Health Assembly as our benchmark, and use our reports to help governments bring in laws to end harmful marketing. The other reports below also show that bad marketing continues – wherever companies can get away with it. A compilation of marketing practices from around the world that violate the International Code over the past 3 years. Collected from IBFAN’s regional and country groups and volunteers, it contains almost 800 legally-vetted entries on 28 companies from 79 countries. Breaking the Rules 2014 in Brief is available as a free download. Here is a report that shows the more underhand tactics used by the baby food industry Interference in public health policy: examples of how the baby food industry uses tobacco industry tactics. World Nutrition. 2017 Explains why and how companies lobby against strong legislation. Don’t Pu sh it 2018. Save the Children’s report, 2018. Comments from Abbott, Danone, Nestle and RB, which can be found on its website alongside its statements in response. 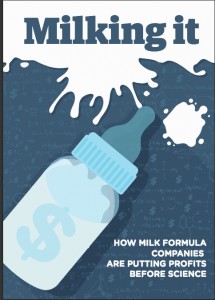 Milking It: How Milk Formula Companies Putting Profits Before Science. 2017 Changing Markets Foundation, Utrecht. 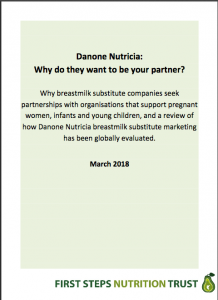 Danone Nutricia – Why do they want to be your partner? IBFAN is a member of the Network for Global Monitoring and Support for Implementation of the International Code of Marketing of Breast-milk Substitutes and Subsequent relevant World Health Assembly Resolutions (NetCode) – hosted by WHO. The goals of NetCode is to strengthen Member States’ and civil society capacity to monitor the International Code and relevant WHA resolutions; and to facilitate the development, monitoring and enforcement of national Code legislation by Member States, by bringing together a group of committed actors to support these processes. The joint WHO, IBFAN and UNICEF Marketing of breast-milk substitutes: national implementation of the international code, status report 2018 is an update to the 2016 report and provides a regional perspective on the legal status of the Code. It highlights the status of a limited number of specific provisions that the authors consider to be particularly important in addressing and eliminating inappropriate marketing practices. The report documents that 136 out of 194 countries had some form of legal measure in place covering all, many or few provisions of the Code. Three countries enacted new Code-related legislation, three adopted additional legal measures to strengthen their legislative frameworks, and two took retrogressive steps by repealing laws or specific provisions of laws. The report also provides information on the provisions about marketing of complementary foods among the 59 countries that cover complementary foods as part of their Code law. Of those, 29 require messages and labels for complementary foods to include a statement on the importance of continued breastfeeding for up to 2 years or beyond, while 23 require mention of the importance of not introducing complementary feeding before 6 months of age. Thirty-seven of the countries prohibit manufacturers and distributors from sponsoring meetings of health professionals and scientific meetings, but in only 14 countries are manufacturers and distributors prohibited from using health facilities to host events, contests or campaigns. The NetCode toolkit was developed by UNICEF, WHO and partners as a resource to reinvigorate and reinforce ongoing monitoring and periodic assessment of the Code and national laws. This is necessary to ensure that national legislation is enforced and that mothers and infants are protected from the aggressive marketing. An organisation called Access to Nutrition Foundation (ATNF), focuses on investing in and working with companies as a way to encourage them to change in its Access to Nutrition Index. Its criteria and approach contain weaknesses and in our view are risky, especially its collaboration with companies on the presentation of the results. Companies are rewarded for ‘effort’ and fundamental loopholes in their policies are ignored. Indeed some ATNI reports suggest that all would be well if the companies implemented their weak policies globally. ATNF collaborates with the companies on the way their evidence is presented. This paves the way for public-private monitoring mechanisms that could undermine legally-binding effective regulation and corporate accountability efforts that are totally independent of industry (see IBFAN comment). 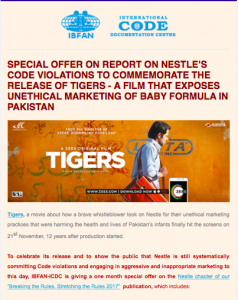 Baby Milk Action is the UK member of IBFAN and monitors companies in the UK. National IBFAN groups produce Look What They’re Doing reports. IBFAN’s International Code Documentation Centre (ICDC), based in Penang, Malaysia, produces global monitoring reports profiling the largest companies. These are called Breaking the Rules, Stretching the Rules. ICDC also produces periodic Legal Updates on new developments. Its State of the Code charts track how well governments are meeting their responsibilities to implement the Code and Resolutions in legislation. There is also a quick monitoring form on the ICDC website for reporting violations outside the UK. Please report violations in the UK to Baby Milk Action. 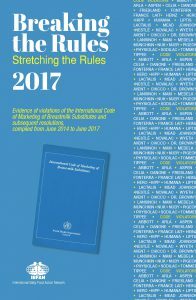 This biennial update on the legal status of the International Code of Marketing of Breast-milk Substitutes was published in May 2018 (http://www.who.int/nutrition/publications/infantfeeding/code_report2018/en/). The report documents that 136 out of 194 countries had some form of legal measure in place covering all, many or few provisions of the Code. Three countries enacted new Code-related legislation, three adopted additional legal measures to strengthen their legislative frameworks, and two took retrogressive steps by repealing laws or specific provisions of laws. The report also provides information on the provisions about marketing of complementary foods among the 59 countries that cover complementary foods as part of their Code law. Of those, 29 require messages and labels for complementary foods to include a statement on the importance of continued breastfeeding for up to 2 years or beyond, while 23 require mention of the importance of not introducing complementary feeding before 6 months of age. Thirty-seven of the countries prohibit manufacturers and distributors from sponsoring meetings of health professionals and scientific meetings, but in only 14 countries are manufacturers and distributors prohibited from using health facilities to host events, contests or campaigns.